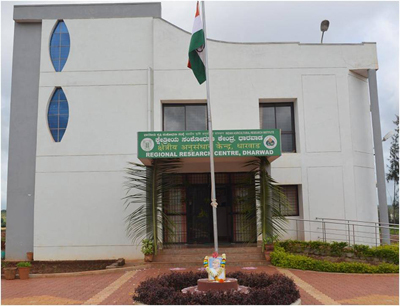 Regional Research Center at Dharwad is an off-season nursery of the Indian Agricultural Research Institute for pulses and other major crops of national importance. It is functioning based on the Memorandum of Understanding (MoU) with the University of Agricultural Sciences, Dharwad. The Centre has three important functions: i) generation advancement ii) disease screening and iii) generation of new crosses. Here chickpea, lentil, pea, cowpea, mungbean, urdbean, pigeonpea and also other crops of national importance such as maize, Pearlmillet, soybean and rapeseed mustard can be successfully grown during off-season for advancing breeding generations. During kharif season (mid-July sowing) winter crops like chickpea, lentil, pea and rapeseed mustard can be successfully grown for generation advancement thereby reducing the cross-to-variety period by half. Besides, breeding generations and germplasm can be screened against major diseases such as powdery mildew in pea and mungbean; rust in maize, pearl millet, soybean and cowpea; and white rust in rapeseed mustard. The crossing can also be attempted successfully in different crops thus providing an additional season to generate more variability and to reduce the cross-to-variety period considerably, particularly in crops like mungbean and cowpea where artificial hybridization is not that successful in Delhi.